I joined the Carbonate Reservoir Group at Heriot-Watt University in October 2014 to start my PhD in fractured reservoir simulation under Sebastian Geiger’s and Florian Doster’s supervision. My PhD project was funded by the DOE of the United States and by Energi Simulation formerly Foundation CMG and aimed at answering an intriguing question: can fractured reservoirs be successfully used to store CO2? Despite simple to formulate, the scientific community has not reached a consensus about the answer to this question yet. This is because fractures pose a challenge well known by the Oil & Gas industry: they conduct fluids too fast in the subsurface and it is often not clear whether these fluids will ever be transferred to the rock matrix. CO2 storage gets more and more recognized by the public agencies and governments as a key tool to achieve the targets of temperature increase. Hence, we may very soon start to consider storing CO2 in fractured formations, so it was a very interesting and “hot” topic to research on. I have finished this journey in April 2018, when I have successfully defended my thesis with excellent compliments from the examiners. I believe one of the most important factors to the success of my PhD research was the feedback I got during conferences, talks and research visits. During my PhD, I had the opportunity to present my research in prestigious conferences; including the Energi Simulation Summit in Calgary. The invaluable feedback I got through questions and informal chats with other researchers helped me to open my eyes to different phenomena I was not considering before. This helped me not only to prepare better for my thesis defence, but also to know the limitations of my approach to model fractured reservoirs. I feel that I have finished my PhD with more energy and scientific curiosity than I had when I started. Which is great, as I am starting a position as Research Associate in the same group. What I also found great is the multicultural environment we have at the Carbonate Reservoir Group. There are more than 20 different nationalities in our group, and this creates a very welcoming environment where the students collaborate and help each other. 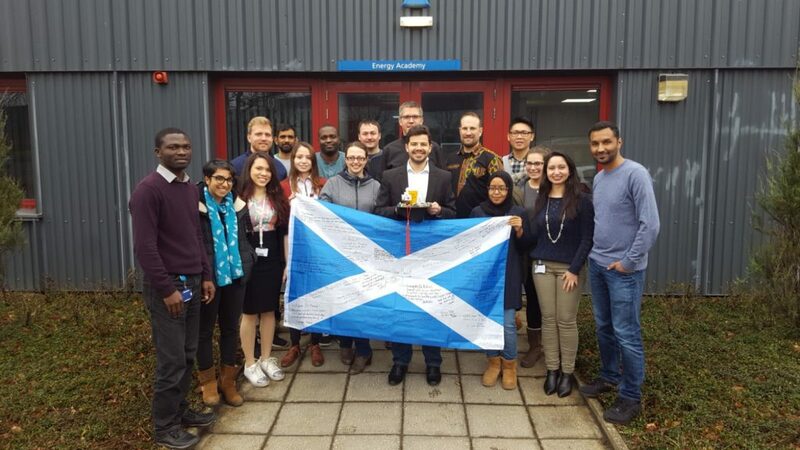 In the end I found out that we all have much more similarities than differences, despite our seemingly different cultural backgrounds, as the general challenges faced during the PhD research somehow help to unite us. I’m very well convinced that I’ll take the friendships forged during my PhD for my life. The PhD journey is indeed challenging but very rewarding. And I really thank Sebastian, Florian and my sponsors for this amazing opportunity that certainly gave a new course to my life. Former PhD at Heriot-Watt University.